Yellow Carbuncle, we choose you. Now here's something different, a match-three puzzler mixed with a Pokemon-style dungeon crawler. That's the basic gist behind Puzzle & Dragons, a free-to-play iPhone and iPad game from GungHo Online Entertainment that achieved over three million downloads in Japan for good reason. Considering how well it blends those two genres, it's like a digital surf and turf. If only we had the Stamina to continue playing. 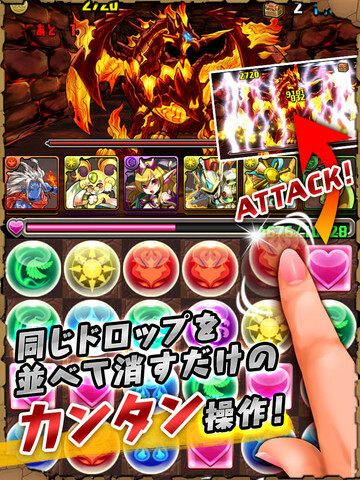 The game breaks down like this: After forming a team of monsters (not just dragons, FYI), you enter a dungeon comprised of enemies of varying strengths, which the app displays along the top of the screen. Meanwhile, a series of multicolored orbs lie at the bottom, and it's your job to match like colors of three or more. Herein lies the strategy. Monsters belong to one of five types (fire, water, air, light and darkness). Matching blue orbs (water), instructs that particular creature to attack, while matching red (fire) tells that beastie to fight, and so on and so forth. The idea is to chain orbs in such a way that you achieve combos and mass attacks where all hell breaks loose, but wait, it gets even better. Unlike most match-three games, you can move these orbs anywhere you want to create matches. Beyond this, you have the option to evolve monsters, fuse characters together to make one all-powerful critter while disposing of copies, and even sending emails/gifts to friends, which makes Puzzle & Dragons social; you can also bring a buddy's monster into battle. Stamina is where things get tricky. Each dungeon requires a set amount to enter, be it 50, 25, 15 or 10. Thing is, once you run out, you can no longer play the game unless a.) you wait upwards of an hour for the Stamina gauge to refill, or b.) you purchase magic stones from the shop, thereby refilling Stamina the easy way. What? 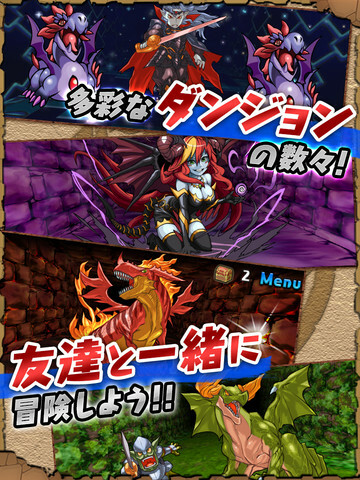 Did you think GungHo would just give Puzzle & Dragons away for free without asking for something in return? Of course you didn't. That said, the whole Stamina thing is somewhat of a drag that ultimately hampers an otherwise enjoyable video game. We dig the whole monster-unlocking thing, and the puzzling is top notch, but having to put the game down is a bit of a bummer. It would be fine if the developers sold magic stones at a discount (or gave us something else to do), but it's one stone for $0.99. That hardly seems fair. Of course, the studio sells 85 for $59.99. Sorry, but we prefer six for $4.99, and even that seems off. Not only that, but the whole fusion/evolution process is a bit tricky, largely because of the game's confusing menus. You'll need to study each screen to get the hang of what's going on. This is a minor issue, though. With this in mind, Puzzle & Dragons still entertains, thanks to hundreds of available monsters, a seemingly infinite number of dungeons and connections with friends. How much fun you get out of it, though, may heavily depend on the time and/or money you wish to spend. What's Hot: Pokemon style collecting with match-three puzzles, endless supply of dungeons, team up with friends' monsters. What's Not: Stamina takes too long to refill, you can only acquire Magic Stones through in-app purchase, evolution process a bit confusing.